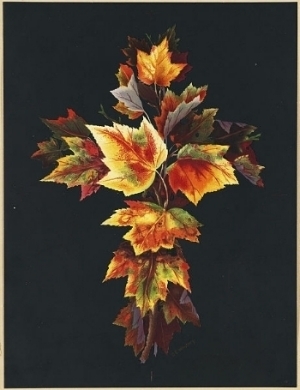 Fall Leaves by Olive Whitney. The November challenge from the Jewelry Artisans Community was to make a jewelry piece inspired by the above “Fall Leaves” paiting from Olive Whitney. I remembered I bought a bag with autumn leaves a few years ago and they would be perfect for this challenge, Just had to go and look where I had left them. 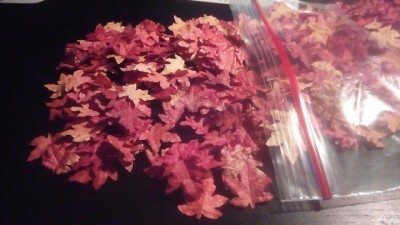 Of course I found the bag and the leaves where way smaller then I remembered but they had to do. It did take a lot of thinking on how to make this one. Part of the foliage are stitched, then I glued the other half onto fabric because the stitching didn’t go the way I wanted it. The thread got tangled in the leaves all the time and it was taking me to long to stitch every single leave into place. In the end I put Tacky Glue over and under the leaves that where stitched in the first round to keep them all in place. It looks a lot like those bib necklaces you see a lot these days. 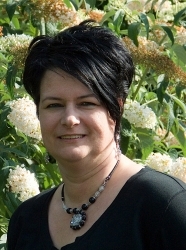 It has been a while that Gayle from 2fabsisters joined us with the monthly challenges and I hope she will join us in the ones to come too. Gayle came up with these lovely earrings. Cat from Cat’s Wire made these loomed earrings for the autumn leaves challenge. These are her own words for her design. 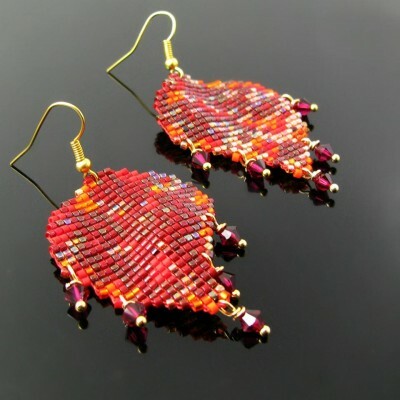 The leaf earrings are bead loomed from different tones of red, amber and orange. 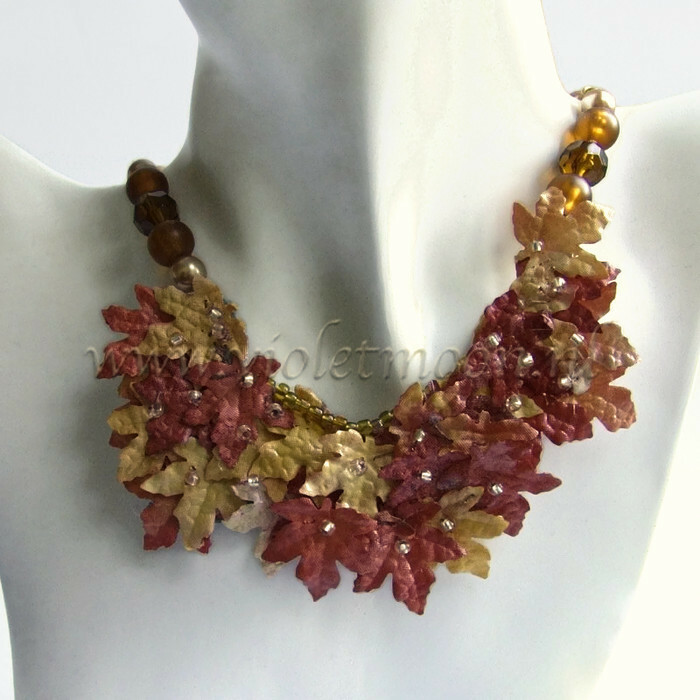 I added crystals, not only because I like dangles, but also because they added the look of serrate leaves a little. Of course they are basically flat, but being so flexible they can be shaped a little and don’t lose that shape again right away. An idea I might have to play with some more. 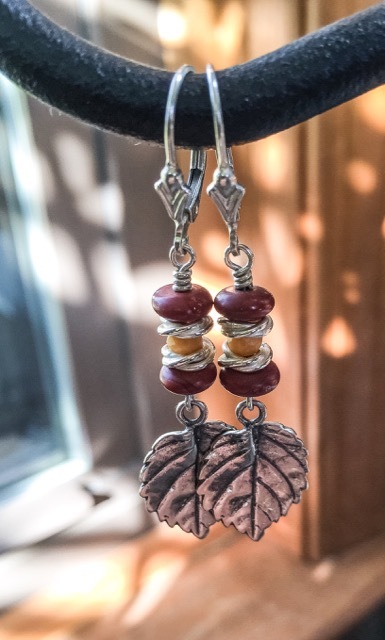 Dawn from Jewelry Art By Dawn used 2 of her wire wrapped leaves and emballished them with beads, I let her explain her design with her own words. This is my contribution this month. 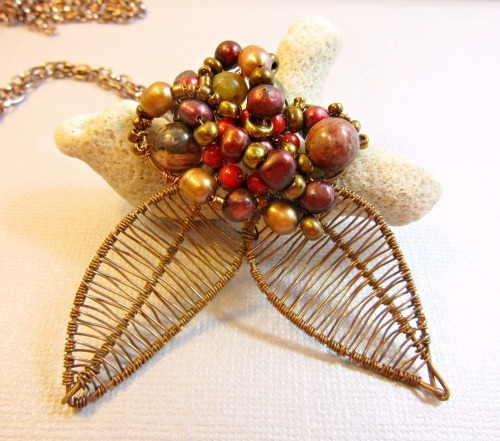 I’ve used this wire woven leaf pattern before; in fact I used it for the shoulder duster challenge. 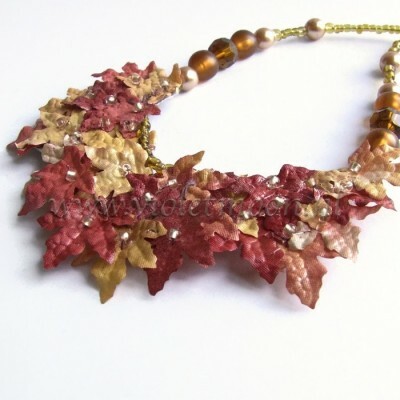 The copper leaves frame with red coral beads was something I used in a challenge a long time ago and I have embellished it with cranberry fresh water pearls, copper colored fresh water pearls, golden glass beads, multi-colored jasper and some green beads that I can’t recall what they are meant to be a cascading riot of fall colors. Feel free to visit the websites from the other artists to leave a comment to share your idea about halloween theme jewelry or just the holiday itself.